Stop cluttering up your house!! 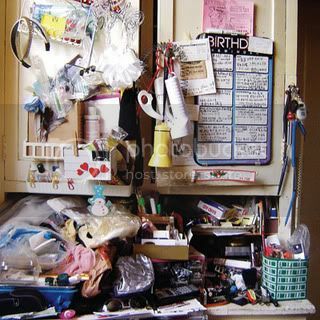 You are here: Home / organize your life / Stop cluttering up your house!! You know I was always bad at collecting stuff, and I guess I still am!! I have all my kids school books – from PREP!!! but they are put away in archive boxes!! I used to buy stuff for my kids that they really didn’t want but I told myself that they would want it – I would’ve when I was a kid. Colouring-in books, paint-with-water books, small nic-nak plush toys from Disney movies – you know all `stuff’ that isn’t necessary and that the kids play with on the day and then never play with them again!! I saw a program once that said that just before Christmas this lady got her kids to empty out their rooms and toy boxes to dontate to charity and to make room for the new toys they would be getting. I tried this and it did give the kids more room but it didn’t help me with buying those little things that weren’t necessary (even if they were on special!!). My friend finally got me set up to sell things on ebay and although I didn’t make a fortune (I think you get more bargains on ebay then actually making big money – but every little bit helps right?!) I found that by putting all those barbies, jigsaws, books and what not together to photo, descripe and sell actually helped me to stop buying unnecessary goods from the shop. When seeing a Christmas teddy in Target for only $2.01 since it was now June I didn’t feel tempted to `get it for the kids!!’. They really wouldn’t want it, I would just be upset that they didn’t think it was as great as I did and inthe end I would have to donate it or try and sell it! Not to mention that $2.01 could stay in my pocket and buy me a lettuce that would be used!! So use something like ebay to de-clutter your house, collect it all together and what ever you don’t sell donate. The experience will give you more room in your house and hopefully, like me, it will help with reducing future spending!! I agree with you. What is the point of buying something just because it is a bargain only to put it into storage. We know there is cheap stuff out there but it is reduced because they couldn’t sell it at full price anyway. If you don’t need something, don’t buy it. Trust me I have had the same problem. Cluttering up my house every year with things that were a bargain. At the end of the year I have a clean out and basically give away the previous years unwanted bargains that never got used… It is a visious circle. How crazy does that sound? Now you all see what a waste of money it is. Why clutter your house with junk. It just makes more work to clean it out.